“This is the one–this is the one I’ll be remembered for,” Ed Wood says, completely unironically, as he revels in the cheesy opening monologue at the premier of Plan 9 from Outer Space. This happens in Tim Burton’s film, anyway, but it’s entirely in keeping with the personality of Wood–a man so in love with making movies that he didn’t much care how he made them, whether anyone ever saw them, or whether they were any good. If you’ve ever seen Plan 9–and if you haven’t, you really should–you probably agree that, as bad as it is, there’s an inescapable earnestness about the thing. That’s why it makes all those “so bad it’s good” lists. I think of Ed Wood occasionally when I encounter an RPG developer who kept cranking ’em out despite what must have been virtually no audience, and Robert “Dr. Dungeon” Deutsch of Allentown, Pennsylvania, must be preeminent among these. Ultizurk II is not his second game but something like his twentieth: the series went through at least nine Zurks (maybe 10) and three Heritage of Zurks before the first Ultizurk, and he had other series called Gork, Babysitter, and Spookhouse. I think Ultizurk I was his first non-text game, but it’s tough to get information on a lot of them. Whenever you see a ludography for Dr. Dungeon, it tends to include a lot of games that were unfinished or existed only as a title. The Shadow Master begins with a sci-fi framing story. There is evidence that Deutsch, unlike Wood, eventually got good at his craft. 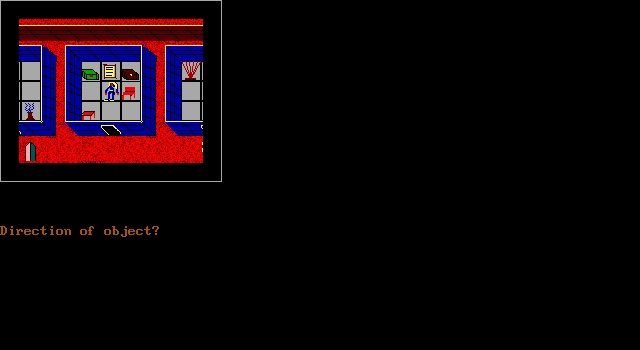 By Ultizurk III (1993), he’s managed to nearly mimic the Ultima VI engine, and his re-release of Madman! (2017) plays a bit like a combination of Ultima VII and Diablo. (Both of them are still pretty weird, but we’ll deal with that when we reach them.) 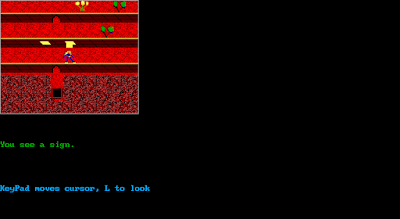 But in these first couple of Ultizurk games, he’s just starting out with graphical interfaces, learning as he releases, and he has quite a bit to learn. Ultizurk I had monsters that couldn’t move from their squares. He’s conquered that–perhaps overly so–in time for this game, but it still has plenty of problems. And yet, like the first one, there’s a kind of goofy earnestness about the game that makes me like it more than it deserves. Despite sounding like parodies, both the Zurk and Ultizurk series are completely straight games that pay homage to, rather than make fun of, their inspirations. Both series feature the same persistent protagonist, who (I gather) becomes a “grandmaster” over the course of the Zurk series. But every time he arrives in a new world, the teleportation process has stripped him of his skills and knowledge, and thus he has to build himself up from Level 0 again. In the first game of this series (which I played about a year ago), he helped King Eldor combat an invasion of monsters by re-powering an ancient race of servant robots. At the end, the protagonist’s efforts to return to his own world are interrupted by an old enemy called the Shadow Master (the antagonist in Zurk II, I gather) who has his own intentions for the Grandmaster. 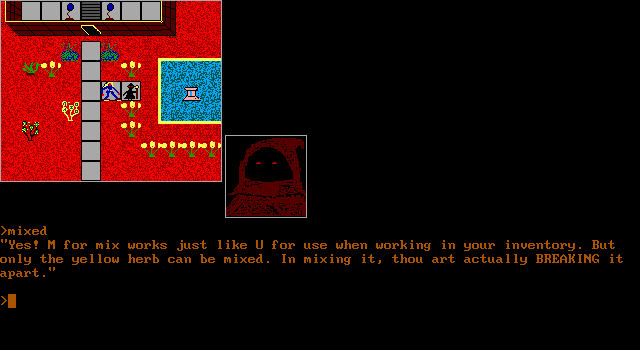 The introduction to Ultizurk II sets the game, like the first one, in a blend of fantasy and science fiction. 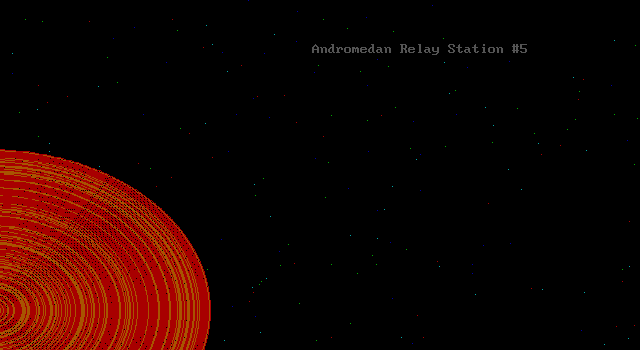 The computer at Andromedan Relay Station #5 is in the middle of a report to its superiors, indicating that “eco-system project 1752RG9 is entering phase 11 decline” because of an imbalance in the water cycle. The life forms on the planet are dying. 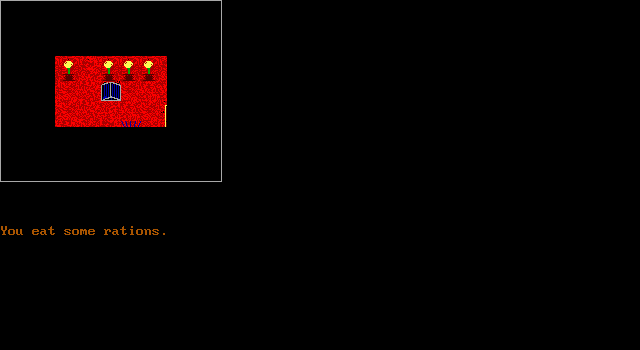 The computer is advising that the project be terminated, when suddenly its monitor beacons show that two “unknown bipedals” have arrived. It cancels the termination to monitor the events. There’s no character creation. 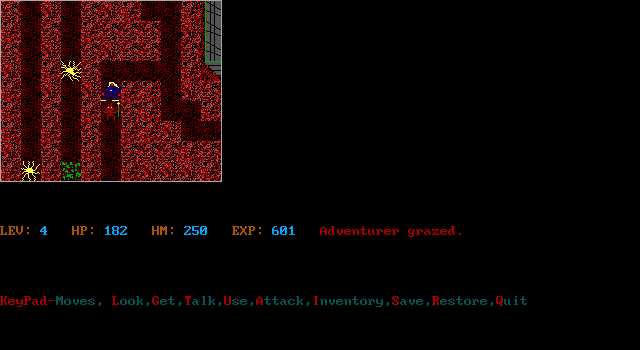 The Grandmaster begins with 85 hit points, no experience, 50 sling stones, and 5 rations of food. Nearby, he finds the Shadow Master, or a projection of the Shadow Master, who says that they are on a planet in the “Arcturian Star System,” although somehow in parallel realities. Each one of them will be working on a quest to power up some machines with crystals, which will somehow get them back to Earth, and whoever achieves it first will become the new Guildmaster. 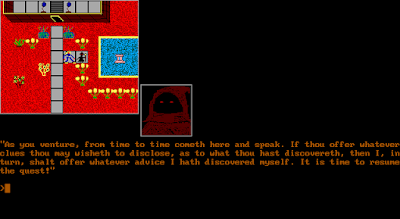 The Shadow Master suggests that the two competitors confer now and then to trade clues. Despite the planet’s water crisis, the Shadow Master is standing next to an overflowing fountain. The opening area turns out to be a small, deserted city teeming with monsters that the player must dodge while desperately trying to find some equipment. Eventually, among the buildings, you find some more rations, sling stones, a sling to go with them, and a club. 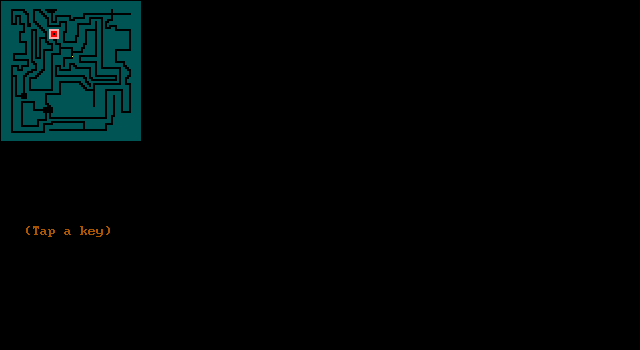 Monsters are pretty tough, partly because their movement is tied to the game clock rather than to the passage of rounds. Thus, depending on the speed of your machine (or, of course, emulator), monsters might flit all over the screen in between any two of your own movements or attacks. But you don’t want to set the speed too low because it seems to exacerbate the game’s persistent failure to read many of your inputs. But it also caches every keypress that it does read, meaning that you don’t want to hold down any of the movement keys because that will lead to a situation where your character bumps into an object for 40 minutes while you write your blog entry and periodically check back to see if the buffer has cleared yet. Another problem is that the author had not yet figured out how to realistically block ranged attacks with obstacles. 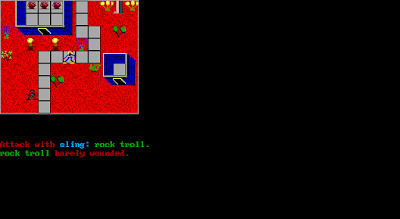 Monsters capable of missile attacks–and a lot of them seem to spontaneously acquire this ability–can hurl rocks or whatever through trees and walls and even from off screen. If you don’t want to waste your own limited supply of sling stones, you have to make your way to them under bombardment and beat them with your club. I died a lot during the first couple of hours. Fortunately, “death” has you immediately resurrected next to the Shadow Master with no loss of items or attributes. Finding items in the opening city. During your explorations, you come to realize that many of the plants on the ground can be harvested for their herbs, yellow and blue ones healing you and green ones causing monsters to freeze for a few rounds. Other items that you find include a tent, a watch, and a map. Using the map gives you a little auto map of the area. Using the tent has you sleep for the night and restore all hit points. 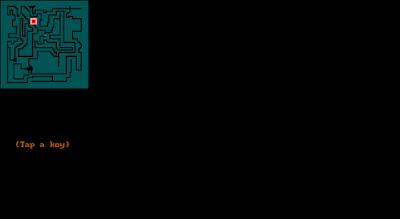 This is something that you want to do every night whether you need it or not, because the game simulates darkness (a la the early Ultimas) by having the window close in around you, making it a nightmare to try to find anything. Best to just sleep until morning. Resting also levels you up, which gives you more hit points and I guess maybe combat skill. Camping with the tent at night. There are other issues with the interface. My character icon looks like a woman in a track suit. Half of the screen is wasted until you bring up the inventory. The inventory screen only lets you “ready” one item at a time, meaning that either it doesn’t support armor (I haven’t found any yet) or you just have to trust that armor items in your inventory are doing something. If you pick up an item, you can only ever drop it on a tiled floor, where it will then block movement. 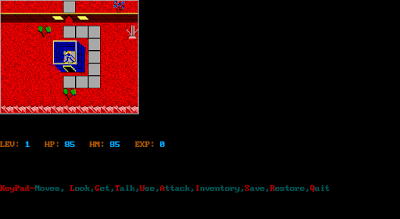 On the positive side, the game follows the Ultima convention of mapping each action to a key and also displays valid current commands on the screen. Targeting, for both attacking and using the “Look” command, works pretty well, although I wish the game remembered the last enemy you targeted. The game tells me that the object in front of me is a “sign” but offers no command for reading it. 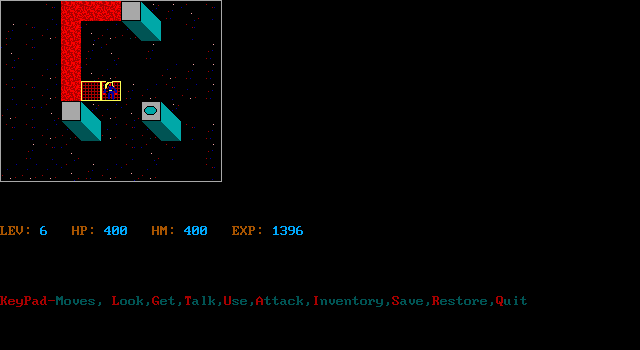 Eventually, you exhaust anything to do or find in the first city. Other than the Shadow Master, there are no NPCs to talk with, although the manual suggests they’ll show up eventually and will (as in the first installment) respond to the Ultima IV prompts of NAME and JOB. Once you’ve explored enough, conferring with the Shadow Master gives more clues to the main quest. He believes that returning to Earth requires you to find five orbs and place them in a machine in a nearby building. Furthermore, he believes that each orb will be found by using a “mind machine” to briefly enter some kind of dreamworld. (As with Ultizurk I, there’s a faint Martian Dreams influence on the plot.) The mind machines, in turn, run on crystals found in the dungeons. I’m glad he figured all that out because I never would have gotten it. Ultimately, the game world consists of several outdoor areas, or cities, linked by long, winding, maze-like dungeons. 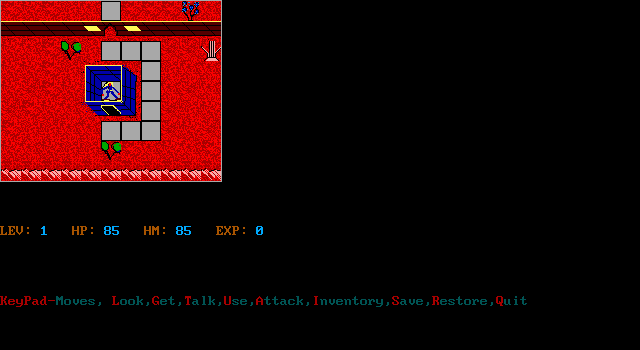 In dungeons, the problems with enemies is multiplied. 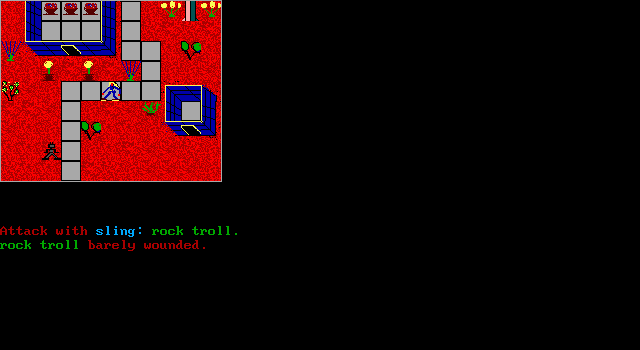 They can fling missiles at you through walls that take you hundreds of steps to circumvent to bash their skulls. 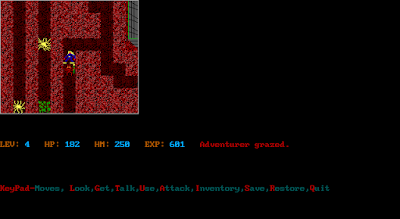 I discovered the hard way that I needed to level up several times and bring plenty of herbs before attempting the dungeons. Wandering the dungeon. All of these enemies can attack me at range despite the walls. 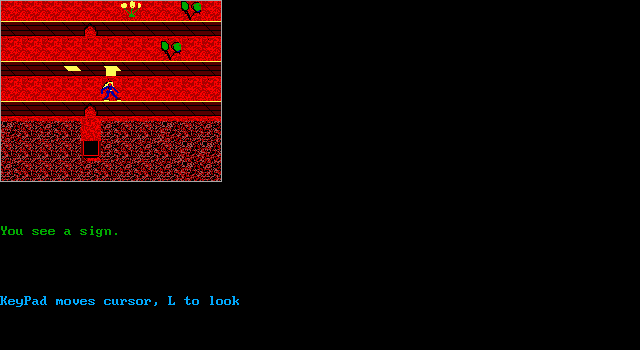 Weirdly, the map itself doesn’t work in the dungeons, but “mixing” a yellow herb produces an automap. The mechanic is so illogical that I feel the programmer must have been compensating for some inability to port the same code used outdoors to the indoor environment, but for the life of me I can’t imagine what the problem would have been. Anyway, the map just shows the dungeon layout, not exits, so you still have to wander around to find those. With the movement issues I described above, I found it easier to save at the entrance and reload when I hit dead ends rather than retrace my steps. You think he could have made the map fill more of the screen? Ultimately, I found the first three crystals in the first three dungeon levels, titled Coprates Chasm, Australis Tholus, and Albor Tholus (all features on Mars and thus strengthening the Martian Dreams connections). I also found a huge cache of rations and sling stones. Not having to engage enemies in melee combat is a big bonus. I returned to the surface, figured out how to drop the crystals in the mind machine in the right order, and entered the dream world. Using the crystals in the mind machine. The dream world was a thin set of catwalks through a firmament. 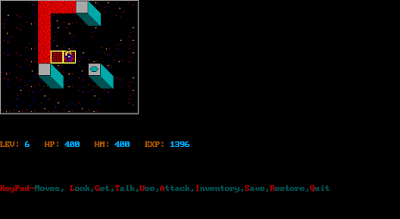 To get to the orb, I had to find two “magic star carpets,” which create bridges across the void. I had to use them strategically to reach an otherwise isolated area. Soon, the first orb was mine. Laying carpet to reach the first orb. 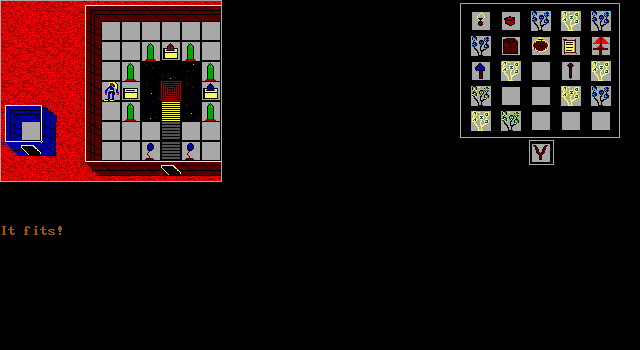 By now, it was clear that, unlike its predecessor, this wasn’t going to be a single-entry game, so I’ll have to continue exploring in future entries. I’ll make a prediction now, though: The Shadow Master will get back to Earth first because I’ll sacrifice time (or some other resource) helping this planet with its water problem. Nonetheless, despite technically losing according to the rules, I’ll get a bunch of extra points for Gryffindor for “having done the right thing” and thus end up the Guildmaster anyway. I know my description makes the game sound pretty bad. But while the interface issues should make Ultizurk II essentially unplayable, occasionally the developer pulls an original idea out of a hat and manages to lure me along for the next chapter. This is not the one he’ll be remembered for, but there’s still something memorable about it. PREVIOUS POST Previous post: AlarCity – Upcoming Amiga game from PixelGlass gets beefed up!